This morning, at the 2018 TEN-T days, a coalition of more than 40 European associations handed over a common Transport declaration to European Commissioner for Budget and Human Resources Gunther Oettinger, stressing the need for more money for transport in the new EU Multiannual Financial Framework (MFF) for the period 2021-2027. In particular, the Transport coalition “More EU budget for transport, the best investment plan for Europe” calls for a stronger Connecting Europe Facility (CEF). 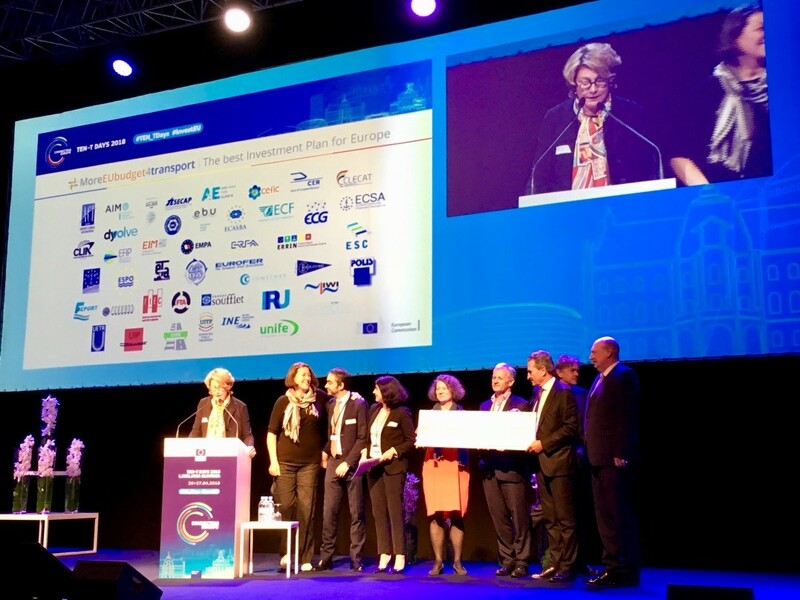 The CEF has demonstrated since 2014 its ability to complete the TEN–T network and to deliver high EU added-value to finance the actual deployment of sustainable, innovative, digital, safe, secure, interconnected and intermodal transport projects, mostly through grants. The Transport coalition represents all transport modes and nodes, infrastructure managers, operators, contractors, local and regional authorities, logistics service providers, shippers, users and equipment suppliers in the maritime, inland waterways, railways, road, cycling, aviation and intermodal sectors, and supports industries and companies as well. On 2 May 2018 the Commission will publish the MFF proposal, the EU budget proposal for the next financial period 2021-2027. This proposal will reveal how much money will be earmarked for CEF. On 29 May 2018, the detailed CEF II proposal is due to come out before going into discussions with the Parliament and the Council. The European inland ports believe that without strong EU investment in transport, the EU plan to create well-working & zero-carbon transport across the EU will not materialize. Since 2017, 3 years before its term, the budget for the CEF Transport has been used. Demand for CEF Transport funds exceeded 2.5 times the available resources. If the CEF Transport budget does not increase in 2021-2027, the legal obligation of completing the TEN-T Core network is at risk due to insufficient budget. EFIP specifically insists that in negotiating the priorities of the EU budget for 2021-2027, higher priority for transport is key for EU jobs, growth and climate goals. An Infrastructure Pipeline for Inland Ports coordinated by the European Federation of Inland Ports (EFIP), issued in February 2018, revealed the future investment needs of European inland ports, estimated at around €13 billion for the period 2015-2030. The pipeline covers 211 different infrastructure projects located in 48 different inland ports in 12 different Member States. “Besides a constant need for investment in hard infrastructure, inland ports face multiple (new) societal challenges, e.g. digitisation, logistics 4.0, the decarbonisation and energy transition goals and multimodality. These challenges need to be properly addressed and supported with dedicated CEF grants. I would like to thank the EU for the CEF €1.65 billion allocated to 52 IWT-related projects in 2014-2017, which have been of paramount help for our sector to adapt, engage and succeed in the new trends of our times. We sincerely hope the good work achieved so far in collaboration with the EU institutions will be strengthened even further in the future, with a corresponding budget” says Roland Hörner, President of EFIP and CEO of the Port of Mannheim (Germany). EFIP congratulates DG MOVE on the successful 2018 TEN-T Days and stresses the high-level and fruitful discussions which took place during three days in Ljubljana.